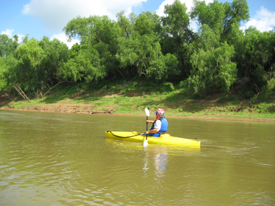 Enjoy a longer paddle along the Brazos River with this 10.4 mile route that offers views of historic bridges along the trail amongst the Columbia Bottomlands. From SH 35 at East Columbia, turn southeast onto CR 300-F and follow to end of roadway. Access is down the bank. Take-out: From SH 36 in Brazoria, turn east on FM 521; turn south on CR 400 (just before the bridge). Turn left at the third road (CR 849) and follow to end. 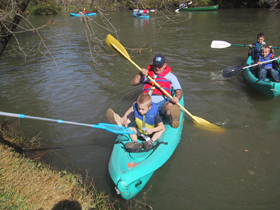 At low to moderate flow, paddlers will encounter sweeping bends with numerous drift areas and some sandy beaches. Be careful of quicksand along the banks. Although there are no man-made obstructions on this reach, there may be snags to avoid, especially when water levels are low. Landmark - At Brazoria, the center support of the original bridge rises from near mid-stream. Just down-river and within sight of the old support are the 1939 Highway Bridge, the 1907 railway bridge, and the new FM 521 bridge. The CR 849 landing is approx. two miles below the railroad bridge, at the apex of a loop in the river. Watch for a gravel bank on the west bank. 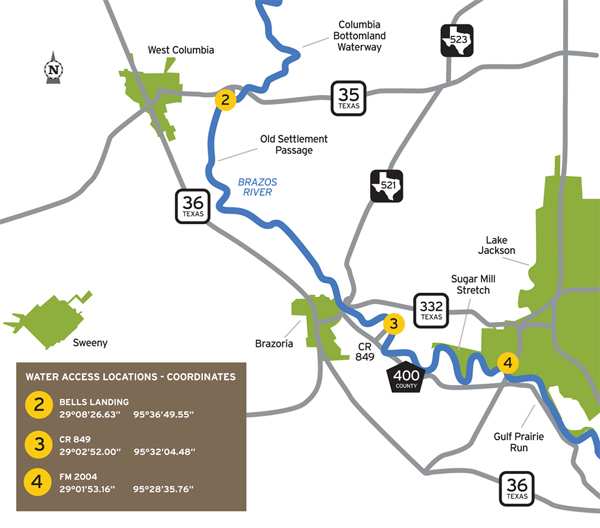 Find information on three additional paddling trails along the Brazos River that are connected to this trail at the following websites: Columbia Bottomland Waterway, Sugar Mill Stretch, and Gulf Prairie Run. This section of the river supports numerous freshwater species of catfish, sunfish, and alligator gar; as the river moves toward high tide, the influx of saltwater brings with it redfish, sand trout, flounder, and other saltwater fish. Small lures such as jigs, plastic worms, spinner baits and light-line are generally recommended. The riparian corridor of the Brazos River supports a great diversity of plant and animal life along the river and beyond the banks. 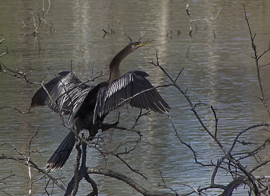 Birds spotted here include many species of migratory birds which vary according to the season. Several varieties of native trees grow along the river, including live oak, ash, pecan, cottonwood, cypress, and elm. 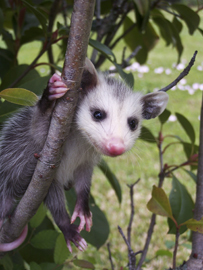 Common wildlife encountered include alligators, deer, and small mammals. It is not unusual to see livestock watering in the river. Variously known as Columbia, East Columbia, Bells Landing, and Marion. Beautiful antebellum homes line the streets in this riverport town. Many have been restored, others have been continuously occupied. Historical markers are scattered throughout the townsite, including the Dance gun Factory, Aamon Underwood House, and Bethyl Presbyterian Church. 200 N. 14th St., West Columbia. Next to Mattson Ringgold American Legion Post 503 is a stirring tribute to all local veterans complete with statues and inscribed pavers. 100 E. Brazos, West Columbia. Roadside walk-through park pays tribute to the rich history of the town with informational plaques and indigenous wildflowers.